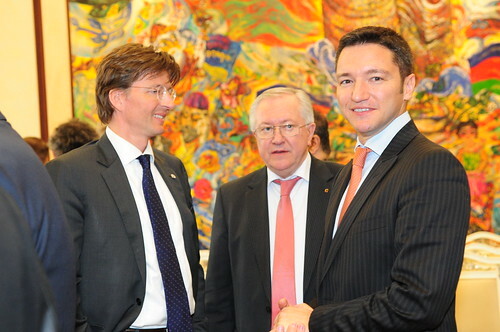 The smiling gentleman to the right is Kristian Vigenin – Bulgaria’s current minister of foreign affairs. Recent media reports say he has directed all ambassadors of the small eastern European republic to refrain from using the most popular social network. “Why is that?” one might ask and the answer is quite simple – for the last 50 days Bulgaria has been facing the largest anti-government protest since January 1997 and statements posted on Facebook show that some of the ambassadors side rather with the #ДАНСwithme participants than with their employer. In other words, Vigenin’s instruction is nothing but a gag order on Bulgaria’s diplomats abroad and speaks volumes about this government’s preference to deal with plurailty of opinion and public criticism. Will Turkey Beat China In Internet Censorship? I must say that during the last year – year and a half I have come across numerous mentions about the Internet censorship faced by users in Turkey, but they somehow failed to attract my attention. of the Internet in Turkey. Bayraktar’s material bears the headline Turkey: Pandora’s Box will be opened shortly… and provides its readers with some intriguing information. Bulgarian readers might be interested to read the blog post I composed in my other blog. For instance, the Turkish Communications Regulatory Authority (Bilgi Teknolojileri ve Iletisim Kurumu, BTK), has mandated that as of the 22 August 2011 Turkish users must not surf on the Internet, unless they install at least one of four specifically developed filtering technologies. Any non-compliance with this legislative measure or circumvention of the filters will expose their actors to criminal liability and charges. to realise that the measure so introduced will directly and disproportionately limit the freedom of expression, information and privacy of the Turkish users on the Internet. Still, Turkey is a member of the Council of Europe and as such is subject to the jurisdiction of the European Court of Human Rights (ECtHR). The partial Internet censorship which Turkey had maintained until now did not remain unnoticed and resulted in that the Turkish nationals Ahmet Yildirim and Yaman Akdeniz brought actions before the Court in Strasbourg. The outcome expected in the rulings becomes increasingly relevant in light of the upcoming total control. But the ECtHR does not represent the only venue where Turkey should fear that its image might be tarnished: the filtering legislation will very likely have repercussions also upon Turkey’s attempts to accede to the European Union. If Turkey sustains its planned filtering measure, it will join the circle of authoritarian states and probably surpass China’s Golden Shield Project in terms of Internet censorship. By the way, what would be your reaction if your government introduced such censorship in your country? Long Arm Jurisdiction: Long Enough To Cross The Atlantic? Imagine you live in the United States and write a blog, compose articles for Wikipedia and contribute for the forum of an online newspaper. You are a really engaged author, but some of your materials happen to defame an individual who lives in the United Kingdom. He is upset and threatens you with a lawsuit, unless you cease writing about him. Will you comply or will you feel safe being fenced by approximately 9 000 kilometers and at least one different jurisdiction? Why? Because the English High Court held that Mr Louis Bacon was entitled to serve Automatic (the company that runs WordPress), the Wikimedia Foundation (needless to introduce them) and a newspaper based in Denver with so-called Norwich Pharmacal orders (NPO). The online platforms made available by above entities had been used by the defendants in suit who had published statements, which in the judgment of Mr Justice Tugendhat “passed the threshold of being a good arguable case in defamation”. The identity of the defendants could yet not be determined. Now Automatic, the Wikimedia Foundation and the Denver Post will be served with NPO and will have to disclose log details and IP address information and thus support claimant to identify the defendants. Do you still feel safe? In fact, Mr Justice Tugendhat has acknowledged the difficulty of the question that had been referred to him. Nevertheless, he has made great efforts to cite all the authority that supports his holding. Hence, what is the message to writers of publicly accessible statements that are likely to be considered defamatory? First, make your research. No matter how harmful your writings are, you cannot be pursued for defamation once you can prove that your contentions are true. reaching across the Atlantic or maybe even farther. How do you feel about your safety now? As early as 1992 Bulgaria acceded to the Council of Europe. The accession meant not only the acceptance of the European Convention on Human Rights (ECHR), but also Bulgaria’s submission to the jurisdiction of the European Court on Human Rights (ECtHR), the authority serving as the last resort against violations of the rights protected by the ECHR. Since its accession, Bulgaria has been found liable for violating human rights in a large number of cases. As of yesterday the number of cases rose by two more (courtesy to Dr Lehofer for sharing this information). In its very recent judgments in Kasabova v Bulgaria (application no. 22385/03) and Bozhkov v Bulgaria (application no. 3316/04) the ECtHR found that Bulgaria had violated Article 10 (freedom of expression and information) of the ECHR. The cases concerned the complaints of two journalists. They had reported on alleged bribes in the admission procedure to specialised secondary schools in the city of Burgas. As a consequence, the journalists were found liable for defamation and were made to pay huge sums in compensation for their statements made in articles published in the Bulgarian press and directed against four administrative experts involved in said admissions. As you can see, the cases are driven by the conflict between two fundamental human rights: the right to freedom of expression (and to inform the public) of the journalists literally clashes with the right to privacy and reputation of the four experts. the ECtHR had to strike a (fair) balance between these fundamental human rights. While the ECtHR acknowledged that the allegations made by Kasabova and Bozhkov had been difficult, if not impossible to prove and that, their journalistic research had shown some flaws, it nevertheless held that the sanctions imposed on the journalists had been excessive, disproportionate when compared to the damaged reputation of the four experts and had thus had huge potential chilling effect. Consequently, there has been a violation of Article 10 ECHR. A shock to the system for the Bulgarian media sector. Why? Well, the majority of the Bulgarian media is considered largely tabloidized and owned by anonymous proprietors. This often results in publications that are clearly false and even defamatory. Even though the Criminal Code penalizes defamation, so far only very few authors of defamatory materials or owners of publicizing media have been successfully charged, convicted and sentenced. Kasabova and Bozhkov seem to be among those few. Should this ruling of the ECtHR be interpreted as a carte blanche to journalists writing defamatory materials? I hope not! On the other hand, it is an open secret that many Bulgarian journalists work under threat or undue influence. For instance, Freedom House designates Bulgaria as merely partly free in terms of press and media in their 2010 report (select country). No doubt, threatened journalists would clearly benefit from above judgments. All in all I would agree with the ECtHR since it does not say that journalists should not be punished, if they write defamatory materials. It says that the punishment should not be excessive and disproportionate to the damage the defamation has caused. Are Bloggers Immune Against Damages If They Say The Truth? It all started this Tuesday while I was reading my daily Slashdot newsletter. I was about to close the tab displaying the headlines, when a single textline caught my attention. It read : Blogger Fined $60K For Telling the Truth . What I initially thought was an absurd story turned out to be a verdict delivered by a jury at the Hennepin County District Court! John Hoff, a blogger who maintains The Adventures of Johnny Northside, came across a mortgage fraud in which the former community council director Jerry Moore was involved. Hoff wrote on his weblog that he had discovered that, Moore whose malpractice had already cost him his job at the community council, had once again been fired by his then current employer. As a consequence, Moore sued Hoff claiming damages for lost wages and emotional distress. Albeit that the jury found that Hoff’s blog post was true, it held that Hoff intentionally interfered with Moore’ employment contract thereby causing Moore emotional distress and was thus making him liable to pay 60.000 USD (see Sheila Regan’s court notes and the Hennepin County District Court Jury Verdict that John Hoff emailed me upon my request). No doubt, this jury verdict is just outrageous. I guess that Moore chose to pursue the course of interference with an employment contract and emotional distress, because he would have failed to produce evidence of Hoff’s actual malice had he opted to sue for libel. But even if Hoff was trying to get Moore fired, people are constitutionally entitled to speak the truth about others, even with such an objective (The Volokh Conspiracy delivers a profound explanation why). Provided that the jury was instructed of this, its judgment is simply wrong. As regards emotional distress, the US Supreme Court held in Hustler v. Falwell that the elements usually required to demonstrate that tort has occurred, are not sufficient in cases involving public figures. In Snyder v. Phelps the Supreme Court went even further, holding that the obvious and hatred-motivated disturbance of a military funeral did not qualify to inflict emotional distress among the mourners, since it dealt with issues of public concern and was hence protected by the First Amendment. In light of the quoted decisions, the judgment of the Hennepin’s jury is not only wrong; it is pathetic. From what I read, John Hoff is going to appeal the decision against him and I believe he has a fair chance of getting it overturned. I blog on this simply because the freedom of expression and the freedom to access information represent our fundamental rights and we must protect them by all means. What would be the alternative? Any wrongdoer discovered by bloggers or journalists would then be able to muzzle and gag them by suing them for, say, emotional distress? Perish the thought! Therefore, I expect the higher judicial instances in the US to provide for bloggers’ immunity against damages, provided, of course, they tell the truth. Did you find this article informative or helpful? If yes, you might want to share it by pressing one of below buttons or to otherwise tell your friends about it. You are currently browsing the archives for the freedom of expression category.